Papunya is a small Indigenous Australian community roughly 240 km northwest of Alice Springs in the Northern Territory, Australia. It is now home to a number of displaced Aboriginal people mainly from the Pintupi and Luritja groups. At the 2006 census, Papunya had a population of 299. Papunya is on restricted Aboriginal land and requires a permit to enter or travel through. The predominant religion at Papunya is Lutheranism, with 258 members or 86.3% of the population, based on the 2006 census. It is the closest town to the Australian continental pole of inaccessibility. Warumpi Band were an Australian country and Aboriginal rock group which formed in Papunya. Pintupi and Luritja people were forced off their traditional country in the 1930s and moved into Hermannsburg and Haasts Bluff where there were government ration depots. There were often tragic confrontations between these people, with their nomadic hunter-gathering lifestyle, and the cattlemen who were moving into the country and over-using the limited water supplies of the region for their cattle. The Australian government built a water bore and some basic housing at Papunya in the 1950s to provide room for the increasing populations of people in the already-established Aboriginal communities and reserves. The community grew to over a thousand people in the early 1970s and was plagued by poor living conditions, health problems, and tensions between various tribal and linguistic groups. These festering problems led many people, especially the Pintupi, to move further west closer to their traditional country. 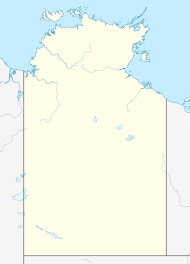 After settling in a series of outstations, with little or no support from the government, the new community of Kintore was established about 250 km west of Papunya in the early 1980s. During the 1970s a striking new art style emerged in Papunya, which by the 1980s began to attract national and then international attention as a significant art movement. Leading exponents of the style included Clifford Possum Tjapaltjarri, Billy Stockman Tjapaltjarri, Kaapa Tjampitjinpa, Turkey Tolson Tjupurrula, and Pansy Napangardi. A substantial bibliography about Papunya art and artists is available from the National Museum of Australia. Papunya Tjupi Aboriginal Arts, a community based arts organisation, commenced in 2007 and hosts around 100 regional artists. These include Doris Bush Nungarrayi. ^ a b Australian Bureau of Statistics (25 October 2007). "Papunya (L) (Urban Centre/Locality)". 2006 Census QuickStats. Retrieved 31 January 2012. ^ Sarah White (June 2013). "Art Centre: Papunya Tjupi Arts". Art Collector. Gadfly Media (64). Retrieved 25 June 2017. ^ "Papunya Tjupi Aboriginal Arts". tjupiarts.com.au. Papunya Tjupi Arts. Retrieved 25 June 2017. ^ "Doris Bush". tjupiarts.com.au. Papunya Tjupi Arts. Retrieved 25 June 2017. Papunya Tula: Genesis and Genius. (2001) Eds. Hetti Perkins and Hannah Fink. Art Gallery of NSW in association with Papunya Tula Artists. ISBN 0-7347-6310-7. "Singing the Snake : Poems from the Western Desert". (1990) by Billy Marshall Stoneking. Published by Angus & Robertson. Papunya Painting: Out of the Desert An online exhibition of Papunya artworks held by the National Museum of Australia. The website includes the works, biographies of the artists, installation images and a bibliography. This page was last edited on 9 April 2018, at 05:57 (UTC).